Iz, loudly and while sitting in a crowded lobby waiting for Leelo to finish his occupational therapy session: "I really love the part of the book about testicles, and how they're the heart of the whole sperm machine!" Once again I draw strength from not knowing a single person in the room. We've decided to take Leelo off his separate dose of magnesium glycinate, since he was taking a magnesium megadose specifically to complement his B6 megadose. His remaining multivitamin supplement contains sufficient magnesium to balance its B6/P5P. 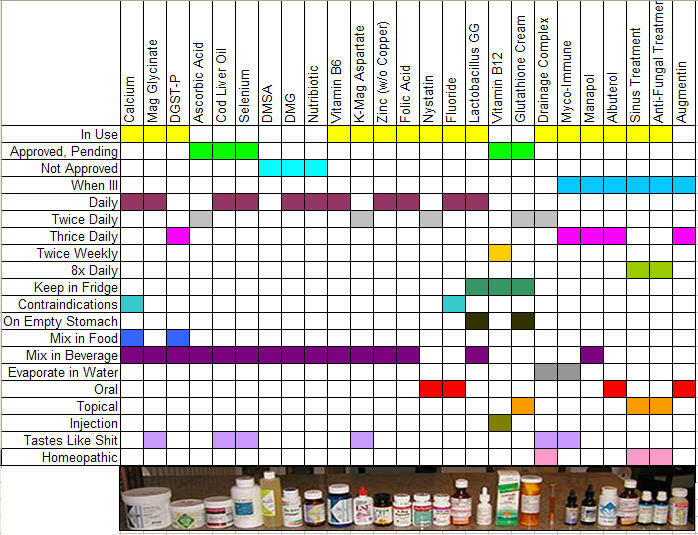 I am so very excited about his super-simplified new dosing schedule that I am posting it for all to enjoy. For contrast, here is his old dosing schedule.